Your search for "vamos" resulted in 12 hits. 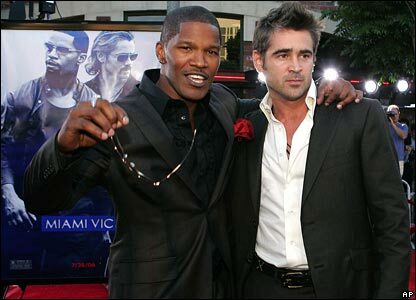 Steve does Vamos a Miami. Conductor has some thoughts on the Vamos decision. “For better or for worse the Miami-Dade School Board voted to remove Vamos a Cuba from school libraries. While I personally disagree with the decision, I believe the board was well within its rights to do so. [ . . . ] So now a judge has arbitrarily ruled that the book be put back into circulation and I have a big problem with that strictly from a separation of powers standpoint. As usual the courts are overstepping their bounds and making public policy.” It’s a point, although I question the aptness of the word “arbitrarily.” I think the courts’ intervention on matters like desegregation and censorship is a good thing. And Conductor never quite explains why he doesn’t consider the school board’s decision censorship. Update: Conductor updated his post, and updated the URL, too, breaking the link above! (thanks Franklin) Here’s the new link, along with a wag of the finger to Conductor and to Blogger: Cool URIs don’t change.
. . . and just like that, Vamos a Cuba is back in the schools for good. Damn, that was fast. (via hiddencity) Update: SDoF has a great quote from the judge: the School Board “abused its discretion in a manner that violated the transcendent imperatives of the First Amendment.’’ Also, a link to the full ruling [PDF]. Update: Oh yeah, they can appeal. Miami Gradebook explains what’s doing with each of the individual members and concludes they probably won’t. Bill’s recent comment on the ‘Vamos a Cuba’ post offers an interestingperspective. He compares the book to Little Black Sambo, and claims that both books must remain available, not despite their inaccuracies, but because of them, as they are part of our history. While the argument is powerful, and works very well for LBS, applying it to VaC is problematic. First of all, the alleged sins of VaC are sins of omission, not sins of commission. Whereas Sambo is wrong because it encourages thinking in terms of racial stereotypes, the most we can accuse Vamos of is of overlooking unpleseant truths. Little Black Sambo does have a place in Americas history and, as such, should be presented for what it was/is therby assuring a thourghly educated populace. I would not want the book to come up in discusion, only to have my child ignorant of its meaning and its history. In some sense, that’s what this fight is about – does our society tolerate accounts of totalitarian regimes that are incomplete in this fashion? Or do we hold them on par with racial stereotypes? It’s interesting to note that VaC is not being condemned for expressing an undesirable perspective – it’s being condemned for not expressing a sufficiently negative perspective — of Communist Cuba. One could make a comparison to a textbook banned in Saudi Arabia for not expressing a sufficiently negative perspective of life in the United States. Or something. 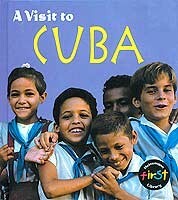 It’s also worth noting that ‘Vamos a Cuba’ is not nearly the sunny portrait of life in Cuba some believe. While the text omits mention of politics, its depiction of poverty is unmistakable. What’s interesting about the VaC situation is that there is no reasonable compromise. Val groped around for it when he tounge-in-cheek (?) suggested placing the book in the fiction section. A more ‘reasonable’ compromise is the warning label approach (“This book presents a view of life in Communist Cuba which many find inaccurate and disagreeable . . .”), which is also so patently absurd that nobody I know of seriously advocates it. We are left with a simple leave it/remove it choice. Blinded by passion, some folks have advocated the removal of this book. I understand their frustration. Were it up to me, I’d leave the book, but in fact it’s not up to anyone – the Schoolboard has made the decision to pull it. From a legal perspective at least, it seems pretty obvious that they fucked up royally. Had ‘Vamos a Cuba’ stayed in our libraries, we, as a society, would have had the opportunity to condemn it as propaganda and distortion. We could have continued to discuss its failings, and let those discussions be the history of this book, not the acceptance that ‘Little Black Sambo’ enjoyed. But there’s the rub: we still can. And we will. Despite the Schoolboard’s boneheaded move, the book is still widely availabe. And it seems pretty clear that the ACLU action will have ‘Vamos a Cuba’ back on the shelves sooner or later. 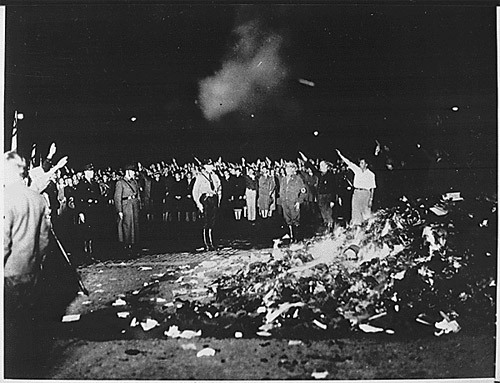 Unlike the Nazis, we’re not actually burning books, and we’re not about to start. Glimpse from inside the Vamos a Cuba appeal. The ACLU is all like, “All a publicly elected body has to do to ban a book is utter the word inaccurate? If that’s the case every library administrator and library association in the country should be worried.” And the judges are all like, “[what about] a book about Adolf Hitler that would credit the Nazi leader with creating the Volkswagen and bringing Germany out of the depression — but not mention the Holocaust.” Also, for the sake of posterity, I’m mirroring the court documents posted at the Herald: School Board’s Complaint [PDF]. ACLU’s response [PDF].